Imagine you’re walking along a path outdoors, you see two little balls of fur on the dirt path in front of you. They’re meowing. Loudly. No mother is in sight. You’re worried for them and you don’t want to leave them in harm’s way. You scoop them up and bring them home. You think you’ve saved their lives. Often, no matter how well intentioned, you actually just sentenced them to live in a cage – for life. In your heart, you want to give them the best chance at life. For weeks, you keep them in your home while searching for the right rehabilitation center or wildlife agency. After a few weeks or more, you finally decide it’s time to bring them in to a rehabber so they can care for them until they can be free. But, the sad reality is, they’re often destined to life in captivity. Picking up or ‘rescuing’ baby wildlife unnecessarily turns these animals into orphans – when they were never even orphaned at all. Their mother’s often left searching for her young. Sadly, baby wildlife that imprint on humans are less likely to survive when they’re released back into the wild. This is exactly what happened to these two brothers from Arizona and why they’ve come to The Wildcat Sanctuary to live out their lives. 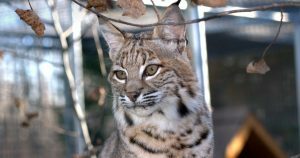 The boys were recently introduced to Autumn, another orphaned bobcat from Minnesota, in hopes they’d create a new family together. Autumn lost the only family he knew when his sibling was hit and killed by a car, and then his mother was killed when she tried to help Autumn’s sibling. Our hope is that Autumn finds comfort here with this new surrogate family and we can see he already has! The boys greeted Autumn right away, but he was cautious. He hissed and observed them from a distance for most of the first day. But, as caretakers approached the next morning, they were so happy seeing all three curled up sleeping together. And the kittens have been inseparable ever since! We’ve already seen Autumn come out of his shell. What used to be a scared little bobcat kitten, afraid of humans, is now romping through the grass after his new brothers. And our hearts melted the first time we saw them all napping in a pile together. Won’t you consider helping rescue wild cats in need by donating today? Or, become a sponsor parent to one of these new kittens! Both boys now have names! The honor of naming them was auctioned off at our annual Jungle Boogie gala to help raise funds for their care. It was a lively auction and both winners chose to honor dearly departed or loved ones with the names they chose. FRANCIS is the bobcat brother that appears a bit more brown and BELVEDERE has a dark black stripe down his back. A fan pointed out that, if you take the first initials of all three bobcat kittens, Francis, Autumn, and Belvedere, it spells FAB. We think they are a fabulous addition to The Wildcat Sanctuary’s family, too! Thank you to Southwest Wildlife Conservation Center (SWCC) in Phoenix, Arizona for originally taking in these two bobcat brothers. Their goal was to release them back into the wild, but shortly after arriving, they realized they’d imprinted on humans and would not survive in the wild. SWCC rescues native wild animals who have lost their homes to development, or are found injured, orphaned, or abandoned. When possible, the animals in their care are rehabilitated and released — healthy and wild — back where they belong. They successfully release over 70% of the animals that are brought to their center. When a wild animal is disoriented, injured or suffering, then it is time to intervene. Getting the animal to a certified wildlife rehabilitator or licensed veterinarian can save its life and provide them the best chance of release back into the wild. Trying to nurse the back to health yourself without allowing them to imprint is almost impossible. Spring brings with it the temptation to pet, touch, or “help” furred or feathered babies. In most instances, however, it’s best to leave baby fawns, birds, or other wildlife alone. First, try to determine whether the animal is hurt or sick. Is the animal shivering, vomiting, or bleeding? Does the animal have an apparent broken limb or wing? Has it been attacked by a dog or cat? If the answer to any of these is yes, then the animal needs assistance. The best thing to do is to contact a licensed wildlife rehabilitator immediately. These experts care for injured, ill, and orphaned wild animals with the goal of releasing them back into their natural habitat. If the answer to the above questions is no, then try to figure out if the animal really is orphaned. Spring is a busy time for wildlife parents, who typically leave their young alone, sometimes for long periods of time, throughout the day. This does not mean that the parent is not nearby and very conscious of its young. Contrary to popular belief, human scent will not prevent the parents from returning to care for their young. These tips can help you decide whether to take action.